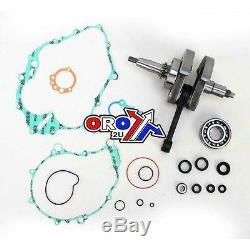 Yamaha yfm350 warrior'87 -'04 yfm350 r raptor'05 -'12 new wiseco crankshaft. This product sheet is originally written in English. Please find below an automatic translation into French. If you have questions please contact us. Wiseco crankshaft assembly with bearings and the main seal defined. Precision-ground mill and OEM specifications assembled connecting rods are double forged to maintain higher dimensional consistency of improved grain flow. Shot blasting removes residual stresses and gently blends the rod forging surfaces. Surface treatment resistant to corrosion. High and low end boring rods with 58-62 rc for optimizing bearing surface performance. Crank pinion bearing running radial clearance is optimized to ensure maximum performance. Precision honing ensures ultra round bearing. High precision lubrication slots maximize rod strength and bearing life. Double-drilled small ends provide piston lax with extra lubrication and cooling, reducing high-end distortion due to heat transfer from the piston. Silver bronze phosphor thrust washers with padded design increase oil retention and reduce friction between the rod interface and the washer. Maneton bearings are manufactured with the highest quality hot-rolled steel - hardened case at 58-62 rc. Needle bearings "cage" provide the highest possible rpm. Webs cranks machined with precision. This crankshaft comes with a premium bearing, premium crankshaft bearings and a full seam pouch that includes all the gaskets and seals needed to fill the position. We have a variety of other parts for this bike in stock, please call us at. If you would like to discuss our discounts for bulk orders. You can also call us with questions you may have about this item, our other items / services or simply discuss your bike in general. All our crankshafts arrive as in the picture - complete, balanced and ready to go! We will also lift in a free oil seal kit! On 3 June 16 at 10:37:39, the seller added the following information. We are more than happy to accept returns. The item must be returned in it's (new & resellable) original condition with all the packaging box, sachet etc. Do not put packing tape on the product packaging. This will result in a 40% restocking fee decrease. For exchanges, the buyer must cover postage costs unless the item is defective or damaged. If you wish to return your item please follow the following steps. (2) make a note inside the package with your user name & reason for return (refund or exchange). (3) send via post or mail of good reputation. If returning due to fault or packaging error, a link to a return label may be provided at our expense. Please make sure the item is sent via a tracking service that we can not refund for items lost during shipping. (4) As soon as we receive the back item we will process within 48 hours. Refund will be completed once the return has been processed. Any return due to buyer error is less postage costs plus 7% restocking fee. Exchanges will be dispatched within 2 working days after the return has been processed. Or alternatively, you can include money with the return to be sent guaranteed r. M or via reputable mail. The item "yamaha yfm350 warrior'87 -'04 yfm350 r raptor'05 -'12 new wiseco crankshaft" is for sale since Tuesday, October 23, 2018. It is in the category "auto, motorcycle parts, accessories \ quad, trike" \ rooms". The seller is "biketyresuk" and is located in / west yorkshire. This item can be delivered anywhere in the world.